Bruce & Katie "Smelling the Roses"At La Gomera Walking we are firm believers in the old adage that walking is for enjoyment and not endurance! We limit our group size to 14 guests and offer a selection of guided walks to suit the relaxed and laid-back walker. We encourage our clients to find their own pace and whenever possible to stop and "smell the roses". 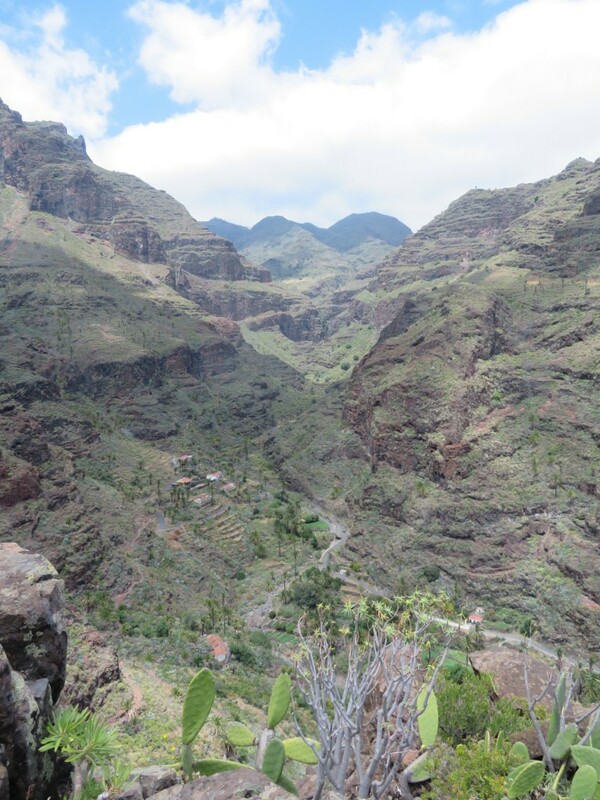 La Gomera is truly a walker's paradise with several hundred kilometres of marked caminos and paths, some of which have been in use by Gomeros for centuries. The highest point on the Island is the Alta de Garajonay approximately 1500 metres above sea-level, and on a clear day the views across the Canary Islands are quite spectacular. Most days in La Gomera the skies are blue and weather is sunny and warm but occasionally in the North of the island and at higher elevations it can be cool & cloudy or misty. Where possible we select our walks each day to give our clients the best conditions for walking. Over the course of the week we select walks which we think best suit the group’s desires and abilities and which give a diverse variety of walking terrain with a mix of ascents and descents to satisfy and challenge all. Our walks would generally fall into the "moderate" category as defined by Ramblers. Some walks are circular but for the most part are linear and we arrange the logistics accordingly. Normally we don’t like “there and back” walks ourselves and so whenever possible don’t include these in our itinerary. Occasionally we may visit a local bar on completion of our day’s walking but for the most part our lunches consist of a picnic somewhere along the mountain path. We recommend that you bring plenty of water (at least a liter and a half per person) which can be purchased in .5 or 1.5 litre bottles from the supermarket. Roque Agando...the most photographed feature on La GomeraDay 1 On arrival we find that many of our guests are apprehensive about the level and pace of the walking and wondering if they will be able for it? With this in mind we always start with a relatively easy descent from Las Toscas to the beautiful deserted farming village of Benchijigua via a gravel roadway with fairly level and good footing. From Benchijigua we pick up one of the oldest mountain paths on the Island which further descends to the picturesque villages of Pastrana, El Rumbaza and Taco. The path is rough and uneven underfoot in places, typical of many of the Island trails and takes about 3.5 hours giving people a chance to find their feet and gain confidence for the rest of their week's holiday. The mountain views are stunning. For each of the walking days outlined above we aim to meet up at 9.30 AM which allows us to be back for 4 PM. 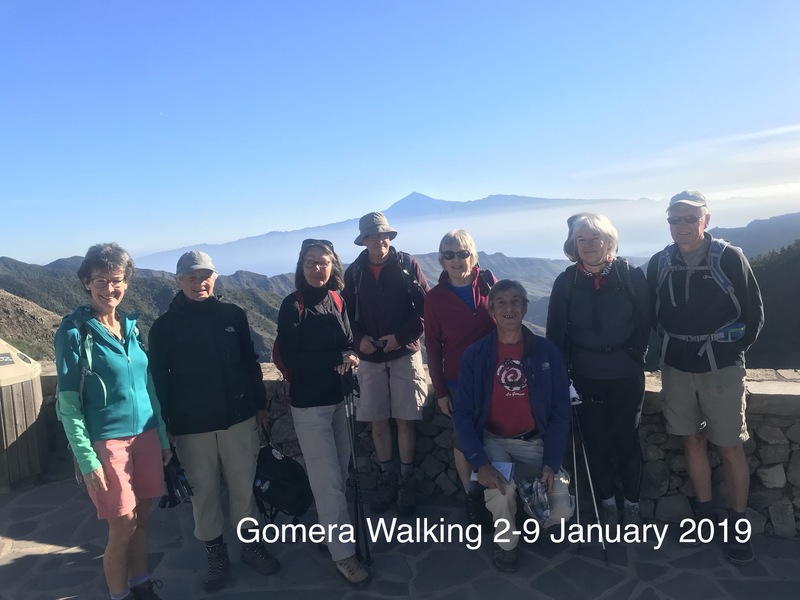 Walking poles are recommended but don’t worry if you don’t have these as Gomera Walking are happy to lend poles free of charge. I loved the unspoilt, natural scenery, it's just an amazing place, along with some great company and great walks, I am already planning my next trip.